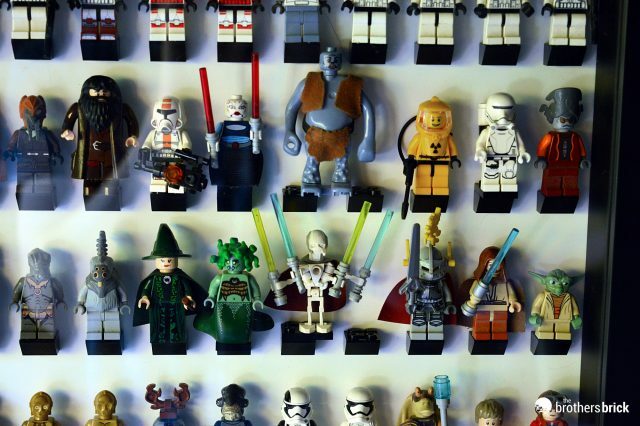 There are many different ways to go about displaying one’s LEGO minifigure collection, and there are many of us who simply don’t bother to go about it–instead stuffing our minifigures in containers and drawers, waiting for the day we will finally have a satisfactory means to display them. 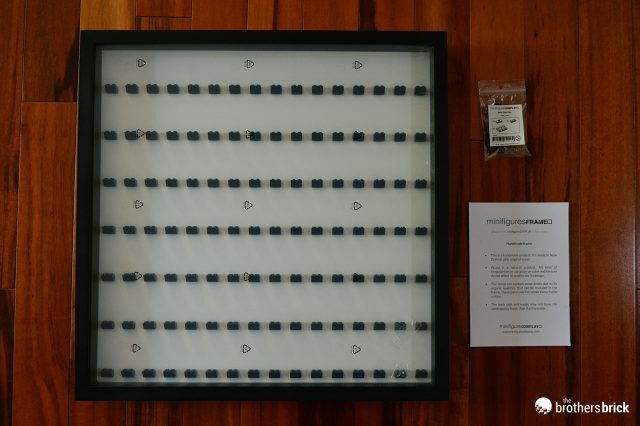 LEGO has officially licensed some small display cases, but today we’re taking a look at a huge 112-minifigure display case specifically made for LEGO minifigures that Spanish company Minifigures Display sent us. This large case sells for 74€, or about $84 USD. 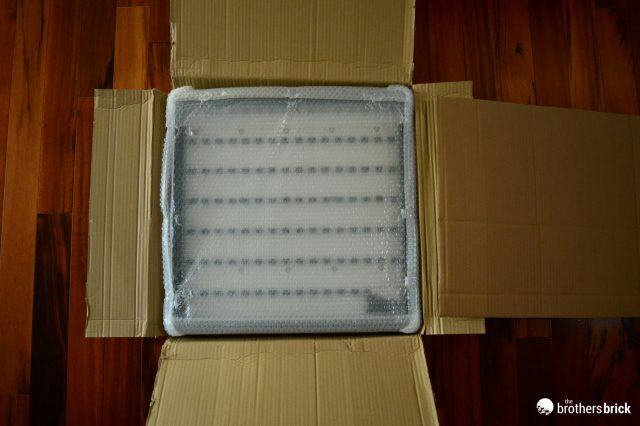 The frame came packaged very securely, wrapped in bubble wrap with the exterior of the box marked fragile. Inside our box we have the display case itself, a little info card and a package of extra official LEGO plates: four 1×2 jumpers, four 1×2’s, and four 2×3’s. This 12-piece pack is sold separately for about $3 and can be purchased as an add-on with the display frames if you don’t have many extra parts in your collection. 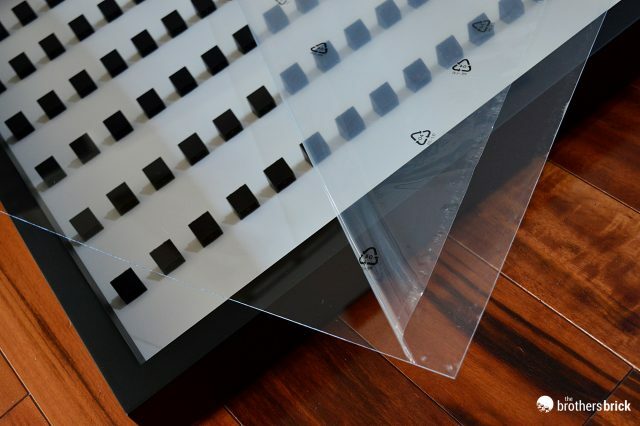 Don’t fret when you see the plexiglass sheet is abnormally cloudy with printed symbols on it, as it’s an easily removable protective film on both sides keep it from getting scratched during shipping and handling. 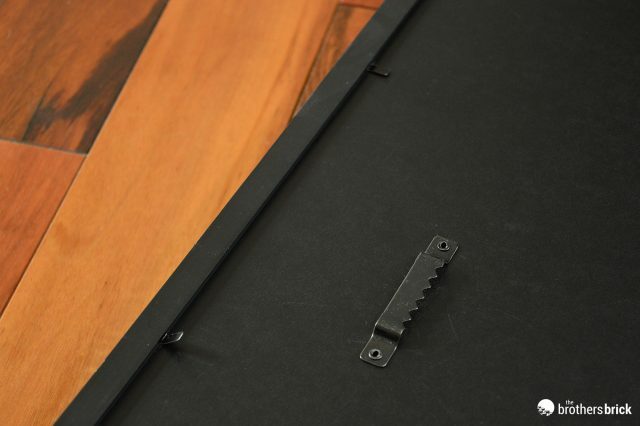 The frame itself is a sturdy construction made from New Zealand Pine. The seams at the corners are almost indiscernible, at first glance it appears to be cut from a single wooden slab. 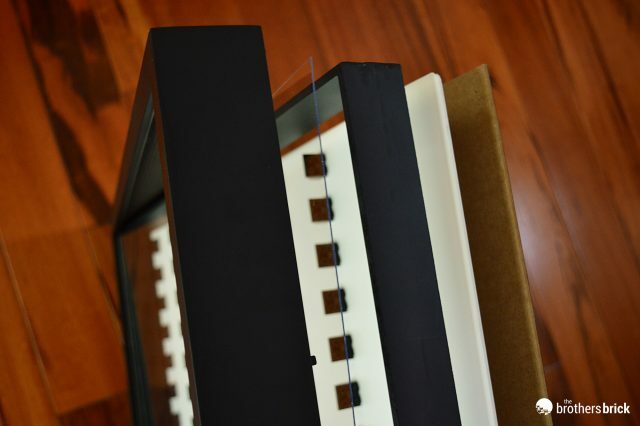 The plexiglass behaves very much like plastic, so you don’t have to worry about it breaking and shattering, while still being very clear. 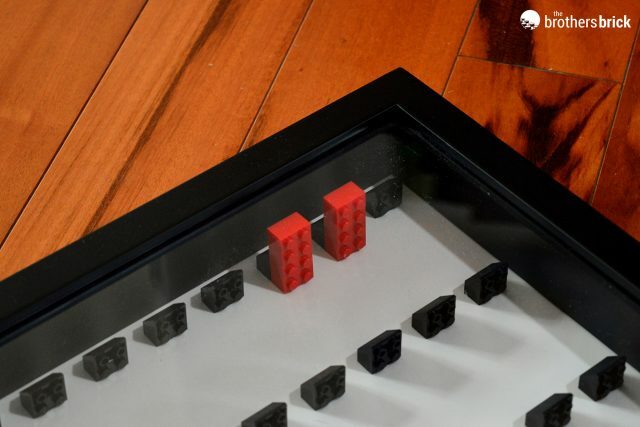 The frame is made up of five of parts, an outer piece of wood that gets hung to the wall and an interior piece of white wood that has the actual minifigure stands bonded to it, plus the two framing pieces. There are seven rows of sixteen stands each on this model. The stands are bonded very securely to the wood backing and it feels like it would take a significant amount of force to break them off. The spacing between the stands might be an issue for some collectors, however, as the distance is slightly less than two bricks, which is too small for some more unusual figures or displaying Collectible Minifigures with their display stands. However, the team at Minifigures Display smartly took this into account, because they do offer another version of the same frame with one fewer minifigure per row, making it exactly two bricks distance between the stands. This way, you can choose to squeeze as many figures into one frame as you can, or have a little less crowded frame with room for the CMF bases. The depth of the frame is just over four studs, providing more than enough space for most minifigures and accessories. I tested it with some of my largest and most geared up minifigures, and unsurprisingly I had to do some shifting and compacting of weapons and such, but I managed to get each figure to fit. 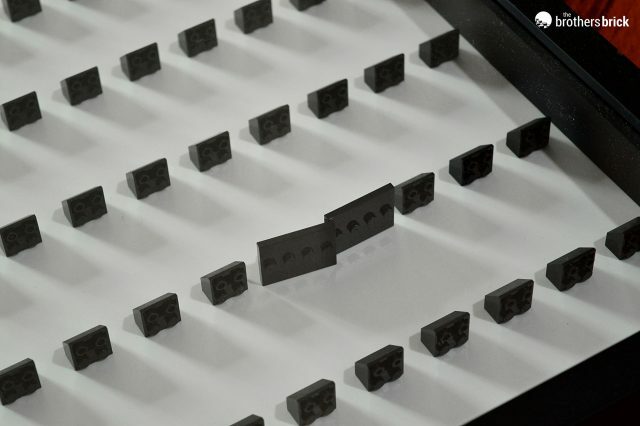 To put your minifigures into the case you first have to flip up the eight metal tabs in the back which hold the frame together, then take out the back to place your minifigures on the stands, much like a traditional picture frame. You can then put the backing back in place and secure it by flipping the metal tabs back down. I never liked using these kinds of metal tabs, even on normal picture frames, as sometimes they can be too stiff and near impossible to bend with a finger. However, these are easy enough to bend up and down and are likely more secure than a method that uses screws and spinning metal pieces. To me, ease of access is key when displaying many of my minifgures, because I frequently use them or parts of them in various builds. 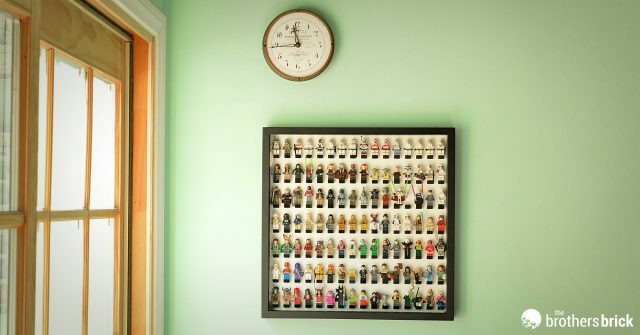 Although the frame will keep your minifigures dust free, once you have it closed up and hung on the wall, if you want to access any of your minifigures, you’ll have to take the frame down and take out the back again. This makes it a good display method for particularly rare minifigures you don’t want to touch, but not a good way to display those you plan on playing with or using in builds. 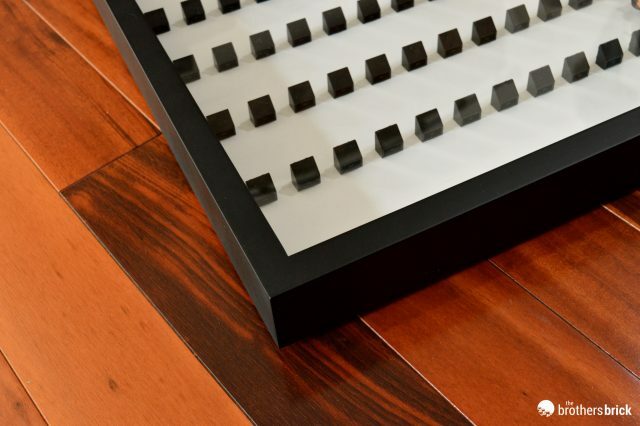 Once you have the frame completely filled to capacity, it does make a great display piece to hang on the wall in your house or office. It’s a nice way to get some enjoyment and value from all those minifgures that otherwise may have just sat in a drawer or been lined up on a dusty shelf. The frame featured in this review will run you 74€ or about $84.00, while the smaller 16 minifigure frames on their website cost 29€, or about $32.00. The large ones especially may seem expensive, but they are a quality piece of hardware, made in Spain and ready to use out of the box. At first, I didn’t think this frame would be a great storage method for me personally due to the lack of accessibility and the fact that I simply didn’t think it was a necessary piece of hardware to have. However, I’ve realized I had tons of minifigures I hadn’t touched in months and now that these minifigures are in they are in the frame and hung on the wall, the whole thing looks quite beautiful. 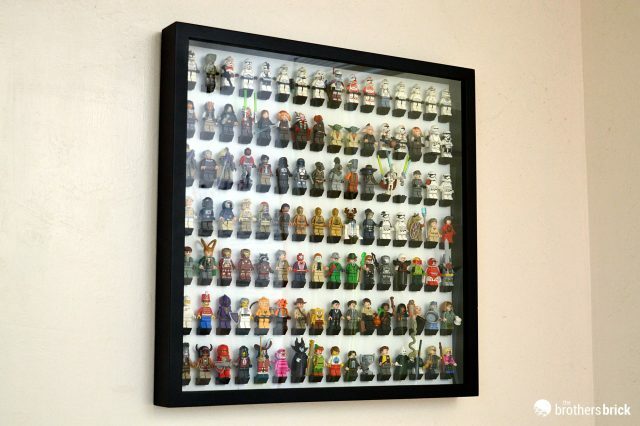 Overall, if you’ve been thinking about a minifigure display frame, Minifigures Display is a great company to go with. 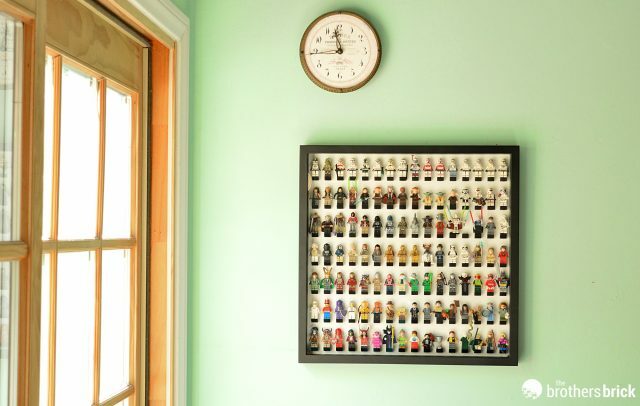 You might not even realize how much you need it until it’s filled up and hung on your wall. This frame and others can be purchased at minifiguresdisplay.com. This product was sent by the manufacturer to The Brothers Brick for review. Providing TBB with products for review guarantees neither coverage nor positive reviews. Looks great but why aren’t there display frames that can be easily opened so you can pick figs to play with or change the display without having to take the whole thing down and take it apart? If you’re looking for a case to open and close, may I suggest one of the baseball display cases. https://acmoore.com/product/104545796/grid-display-case/1488438 they list for $44 but coupons are plenty for AC Moore and you should be able to get one for @25 USD. Each baseball slot is large enough for 1 to 6 figures on CMF stands. This is just an Ikea picture frame with some bricks glued in! Literally could do it yourself for less than half the cost with minimal craft skill required. I have two of these and these are just excellent. Highly recommended! I don’t know… I have to voice concerns. These could be made with better quality and care. Originally we had ordered one, the white background, black frame, with no cover sheet. It was nice. Then we ordered 3 more: one black one with a black frame for Star Wars, one of the 16 piece Star Wars ones, and a 16 piece for the Simpson’s. The second big one showed up and several pieces had broken free from the epoxy they used to bind the pieces. That’s an issue that could be fixed with using screws to drill the pieces to the back plate. Luckily we could epoxy them back in place. However we cannot be the first to have that happen. Third, the Simpson’s set actually tore from the backing plate. We also had to epoxy that piece back on. It seems that the slightest bit of pressure on the pieces can cause them to break free. Which is irritating when some of the backing is basically card stock. I do agree that they look nice and I enjoy them. However they could be better designed for QA by using a better backing plate and/or screws into the actually pieces. And anyone can get one without the cover plate. That way figures can be accessed and replaced whenever needed. Not sure why you guys chose one… if one of them falls off when putting it on you have to take it all down again, remove it, and fix it. That doesn’t seem appealing. These are not the IKEA frames. They are of better quality, handmade and much deeper than Ribba. While probably not pertinent to the product that was reviewed, I’m disappointed that you’ve chosen to highlight a company that seems to have a pretty blatant disregard for intellectual property (LEGO, Disney, Star Wars, Marvel, DC, etc. etc. etc…….). Captain Mutant, try minifigDisplays.com for wooden versions with acrylic fronts and removable shelves.